When it comes to notorious German director Uwe Boll, many are still waiting for what could be the man’s first genuinely good movie. The man has been prolific over the past ten years but sure-fire candidates for First Good Film, like Max Schmeling or Attack on Darfur, inevitably have some tragic flaw or approach that places them back in mediocrity, the company of many of Boll’s other movies. After reviewing more Boll films than a human should be allowed to willingly, I feel like I’ve been beaten down enough that when I find something that genuinely works, be it an actor or a sequence or plot turn, that I should be just as vocal as with the contingent of failure. So allow me to refreshingly applaud Boll for Assault on Wall Street, on coming up with a topic and a story structure that… actually… works. It not just works, it succeeds, and if a more polished professional screenwriter got a hold of this, I think it could actually impress the masses. If it weren’t for the surprisingly effective war drama, Tunnel Rats, I’d say without a doubt that Assault on Wall Street is the best work of Boll’s much-maligned career. And yet… it has just enough minor faults that hold it back. Jim (Dominic Purcell) is a regular guy working as an armored security transport. His wife Rosie (Erin Karpluk) suffers from a rare tumor that requires an expensive series of injections to keep it at bay. Their insurance company won’t pay, and so they have to rely on Jim’s savings. Except those are gone as well. Jeremy Stancroft (John Heard) has ordered all his brokers to dump toxic assets, eliminating most investor savings but profiting the shareholders. Jim and Rosie are broke. Vowing vengeance, especially after some drastic decision-making by Rosie, Jim sets off to make the high-priced traders and corporate raiders on Wall Street feel the pain of what they have wrought. The setup is concise and Boll does a nifty job of compounding Jim’s problems and showing how all the industries are interconnected to put the squeeze on. Because of unscrupulous health insurers, his wife’s medical treatment, deemed experimental, is quite expensive and they’ve reached a cap. With the brokers pushing their clients assets into junk stocks, at the behest of the betters and for commissions, Jim loses his entire financial cushion. He hires a lawyer (Eric Roberts) but has to pay $10,000 just to retain him to fight the $60,000 penalty his broker says is owed. He goes into debt and refinances his skyrocketing mortgage (variable rate) to pay for his wife’s treatments. His employer takes notice of his perilous situation and is uncomfortable with enlisting someone in deep financial woes with guarding money. He loses his job. The bank is poised to foreclose on the house. His wife won’t get her treatments to save her life. All of this leads to a drastic and completely understood decision of desperation and sacrifice. Admittedly, Boll does a compelling job of connecting all the dots, making each new pitfall a result of the previous, each compounding the misery of Jim. It takes a little long to go through all these points, and I think Boll could have trimmed it down so that a key event happens at the Act One break point, but I was flabbergasted that the man found a story structure that succeeds. The second half of the film is Jim planning his vengeance, and after all of the callous movers and shakers have bled him dry, you’re onboard for some sort of righteous payback. Boll takes on Wall Street and the healthcare industry (double the populist outrage). Jim as a character could be made much more compelling, but he’s really serving as a symbol for how the forces are ganged up against the little guy, how the fix is in. When confronted, the big CEO of the brokerage firm barks that it’s always the same old story, that the titans of industry were all crooks and manipulated the system to their advantage, and he’s no different. In short, the little guy always loses. What holds back Assault on Wall Street, beside the fact that the titular assault is reserved for the last fifteen minutes of the film, is its too slick ending and Boll’s obvious transparency when it comes to his political message. After Jim suffers loss after loss, he puts together a plan pretty quickly, utilizing that Army training we’ve heard about. It’s actually too easy with little complications that can’t be solved in a David Fincher-style montage of death. It’s a full 70 minutes before he takes out his first Wall Street fat cat, and that’s just way too much dawdling. And then from there the climax involves Jim just going on a rampage in an office building, shooting several faceless employees who could very well be innocent for all we know. I think Boll is satisfied with a guilt-by-association catch-all for Jim’s fury, but it would be more satisfying just from a payoff standpoint if we saw these people in villainous lights prior, kind of like what Saw 6 did with its insurance characters before turning the tables on them. The last thing we need in our populist screed is to worry that the wrong people were dispatched. And what kind of office building fails to evacuate after a confirmed shooter has attacked? This storyline could have also worked in a Falling Down turn, where a man consumed with evening the scales of a system broken loses his moral bearing and lumps all guilty parties together and condemns them all. Perhaps it was meant to examine the slippery slope of vigilante justice and how this too can decay one’s sense of self, sort of like what Jodie Foster went through in 2007’s The Brave One. However, I don’t think Boll was intending this direction because he’s not very subtle about anything in the movie. Oftentimes the characters just become mouthpieces for ideological talking points: “We’re busy busting some homeless guy when the real criminals are on Wall Street.” The bad guys actually say, with no hint of self-awareness, “We all took a loss. When I told my wife we couldn’t vacation in Barbados any longer…” It’s all just a little too on-the-nose to remind you of the overall intent rather than the story. Therefore, I think Boll is just going for a sense of (misplaced?) justice in the end, in a ludicrous plan that somehow invalidates witnesses, forensic evidence, and security footage to pin the blame on someone else. It’s too clever by half that it undercuts the final payoff. It gets even worse with the Batman-esque voice over to close out the film with a promise to all evildoers. With such a tight focus on the plot, the acting is a marked step up from previous Boll outings. Purcell (TV’s Prison Break, Killer Elite) doesn’t exactly come across as a regular Joe but he has enough onscreen presence to pull off his character’s anguish as well as the requisite badass stuff. And apparently Boll has become fond of him because Purcell is scheduled to appear in future Boll films. Karpluk, a Canadian actress best known for the TV show Being Erica, has a natural grace to her, forgoing big moments to concentrate on the gnawing guilt and concern her character feels. While she’s a bit too willfully ignorant early on, Karpluk makes you care and provides whatever depth can be applied to Jim. I’m actually curious to see her comic skills since she has a face tailor-made for romantic comedies. Heard (Sharknado, Home Alone) doesn’t seem to embrace his duplicitous CEO role with enough gusto, appearing to be annoyed when he should be menacing. This is not the kind of movie to hold back. There are plenty of other Boll Players, including Edward Furlong (3 appearances), Lochlyn Munro (2 appearances), Tyron Leitso (5 appearances, also stars in Being Erica), Michael Eklund (8 appearances), Natassia Malthe (4 appearances), and the stalwarts of Clint Howard (6 appearances) and Michael Pare (13 appearances). It’s been 13 years since Eric Roberts (The Dark Knight) last appearance in a Boll film. Most of these are blink-and-you’ll-miss-them, but then there’s Keith David (The Thing, Cloud Atlas) in a thankless role that didn’t need to exist. But hey, I’ll take Keith David in anything. 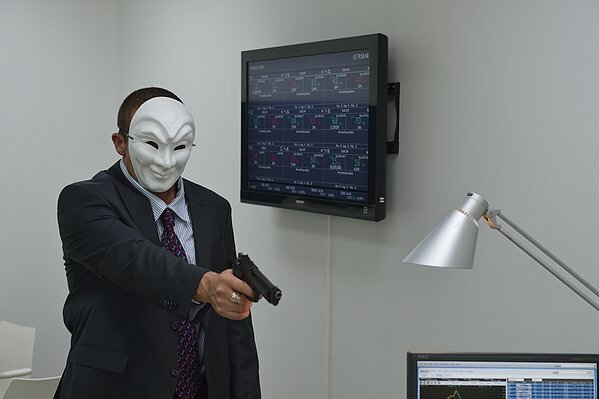 A welcome surprise, for the most part, Assault on Wall Street is a finely structured revenge tale with clear and precise plot points and a natural buildup. It’s Boll on a soapbox and the naked transparency of his ire and populist messages limits the effectiveness of his storytelling, but you might not mind, especially if you are a person who has slogged through far less competent Boll ventures. There is a marked improvement in just about every facet of filming. It genuinely works, that is, until the pacing becomes lopsided and the end just reverts to celebratory action mode. A more professional writer could take this film and whip it into a crowd-pleasing populist thriller. It’s got so much that works, and genuinely works well, that I feel like a buzzkill to keep harping on the elements that do not succeed. But if Boll wants to earn an undisputed victory, he’s got to earn it without lowered standards. 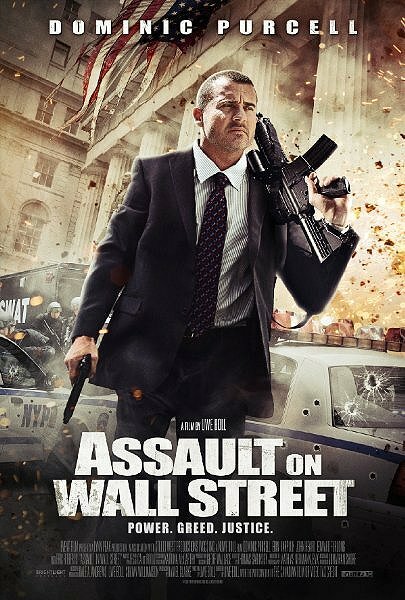 Assault on Wall Street is so tantalizingly close to being Boll’s First Good Film but it doesn’t capitalize enough.